Hello! Long time no see, ne? Well, I've been working on a lot of stuff lately...including wallies, yeah. I just don't seem to have as many ideas as before... or as many time to work on them... or as many inspiration to take them to a good end... or all that at the same time. But what am I talking about? I'm boring you guys! About the wallie: I wanted to keep this one simple. And as usual, simpler means harder. However, it's a beautiful scan, and I wanted it to look the best possible. Again, I think I did something hopeful. I mean, if you are in the middle of the desert, wouldn't you like to meet such a cute girl, even if she's nothing but a mirage? Anyways, I've always liked the desertic locations, it just gave me the oportunity of making clear skies and dunes. Those were not that easy, not to mention the palm trees. But whats an oasis without palm trees? So there, I hope you like it and coment it. I was really surprised when I tested this one in my desktop. Please do tell me what you think! Browse Tenbatsu Angel Rabbie Gallery: Recent | Popular. Oh this is cute and a very nice idea. I wish I could come up with something originalish. ^_^' A pretty background too. Great work! I realy love the hole idea of this its truely amazing the tittle is perfect for it!^-^! Nice done ^_^ The bg is so nice with a realistic scene ^_^. And the way you make the chara looks like moving is so cool >_<! iary has done it once again! great work chic.. i personally like de illusion effect.. well done ! Magnificent wall you have made. The bg is so nice with a realistic scene. That mowing thing is absolutely great. Well done. Wow I love it. I love your talent and creativity my friend. I love how you have her in this wall. 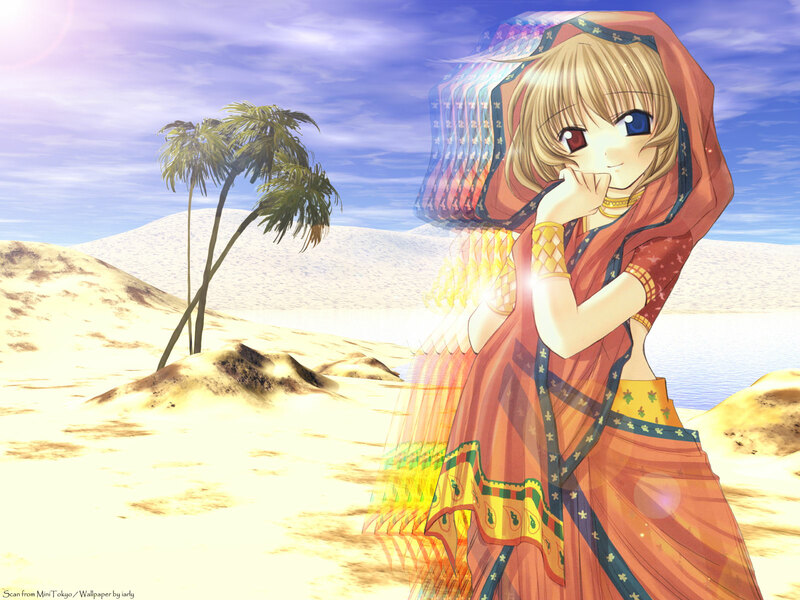 :) Oh cool her eyes are two different colors, and the background is so nice the sky and the sand are so lovely. You still have it :) I LOVE IT. Great Job ! why dont her eyes have the same color? Only thing I don't like are the many duplications of her. Anyways, about your wall. The dunes are great, nice combination of texture and depth also the mirage set is great... only I think the palms could use a bit of texture but they are good. The fade effects of the scan are a great idea for the hole 'mirage' concept... though I believe that the effect could look cool if the secondary layers were a bit more transparent, giving it a more subtle aproach I guess. Quote by EmmaYou never bore us iarly. true, not with your works nor with your words ;) I wonder what surprise are you cooking in your head for the next time... keep up the great work! Nice wallpaper. It gives me a feeling of emptiness (of course, it's the desert XD). However, the cute character gives a certain balance to the whole image. Good work!